Meeting the same strict safety and service standards we deliver for Telaga Waja river, it will challenge you and your guide every step of the way! Come and enjoy this great whitewater rafting tour with a gorgeous view. The thrilling Telaga Waja adventure begins in the foothills of the sacred Mount Agung, after an in-depth safety and equipment briefing by our experienced guides. 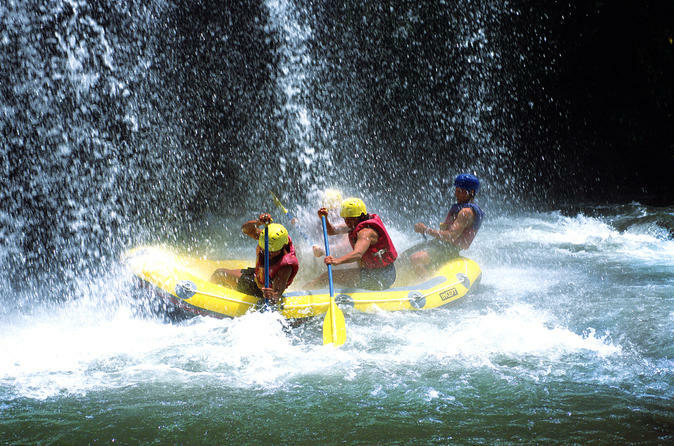 From the time you drop into the first set of rapids, your heart will be racing and adrenaline pumping. In a continual spray of white clear water, you will rush past steep banks and ancient hanging trees, whilst rafting guides will give you instruction and work with you to safely navigate the raft through torrents, twists, tight turns and inclined rapids. Overhead obstacles, narrow gorges and breathtaking views of terraced rice fields all along the way will give you an appetite for your final challenge - the water dam! Hold on, Take a deep breath, and down you go! Our Telaga Waja experience is a fantastic experience from start to finish. From the moment you put on your life jacket and helmet and take a tight grip of your paddle to the very second you finish your last taste of the delicious mouth watering buffet, this really is thrills all the way!